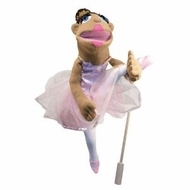 This playful plush Ballerina Puppet is a great pretend-play pal. The cute and cuddly character is easily animated, fun to play with, and inspires the imaginations of kids and parents alike. Puppet wears a highly detailed outfit, and includes a wooden hand rod to control hand movement. Measures 15" x 9" x 4."